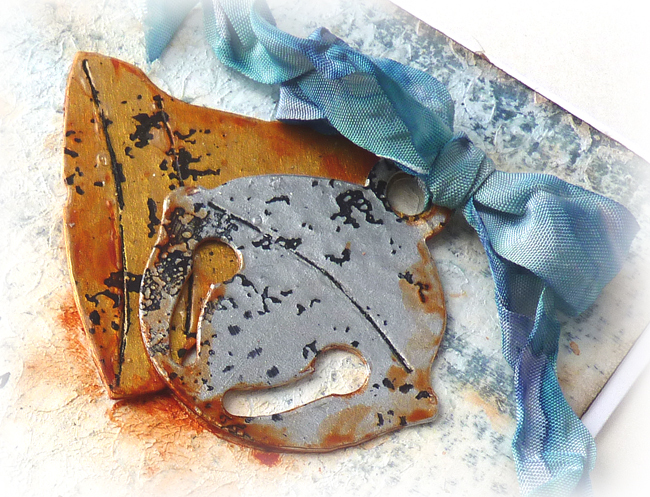 I have a project up on the DecoArt Mixed Media blog showing how to create a pitted surface using paints, mediums and UTEE. I made swatches for faux metals and faux enamelling and linked it back to a fossil panel post back in September where I grunged up the surface and promised this technique would come later in the year. So here it is. All the main steps for the technique can be found on the DMM blog here. But I also made a Christmas card to show how the technique could be used for other projects and this one shows the gold and silver samples used for the bells. 1. Take a piece of good cardstock and dry brush a layer of gesso over it. I use a brush with very little on at a time so that parts of the card still show through. 2. Dip the card in some watery titan buff and dry. 3. Rub pumice stone distress ink pad over the whole surface, spritz with water. 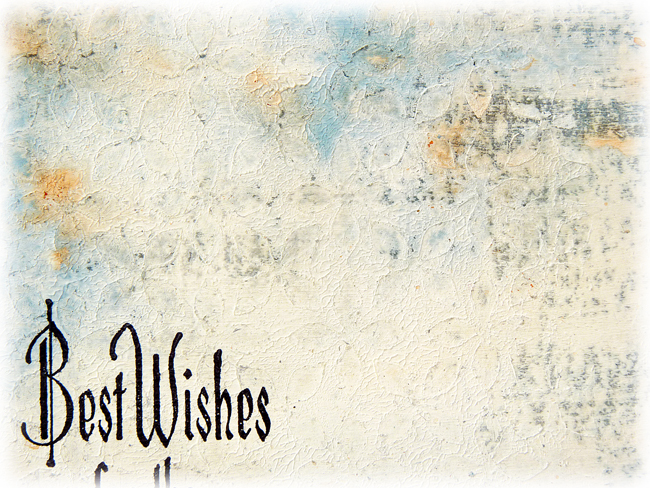 Rub the excess off and heat dry to watch the random patches of the card soak up the ink. 4. 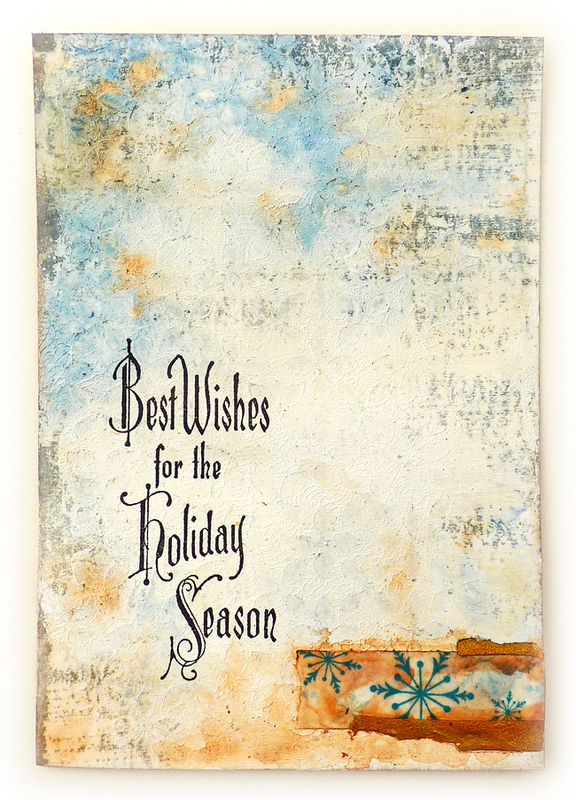 Paint the Nordic stencil (by Tim Holtz) with gesso, lay over the card gesso side down and rub over. 5. When you peel back the stencil you have the design imprinted on the surface. 6. 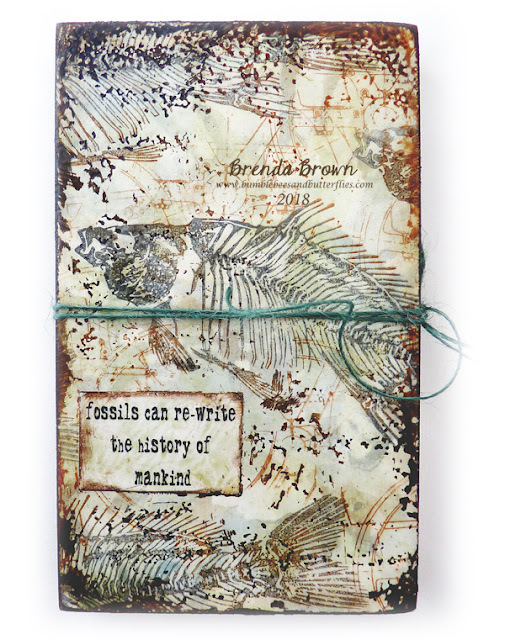 Dry the gesso and rub an iced spruce distress ink pad over it, spritz with water and dry. If necessary add some more puddles of blue with stormy sky - dry again. 7. Add some touches of tissue/washi tapes. 8. Spritz with water and flick some splatters of a watery wash of quinacridone gold, spritz with water if they don't disperse enough and dry. You can see the subtle texture from the stencil on this photo too. 9. Add some neat quin gold around the tissue tape, spritz and dry. 10. Use a stamp platform to stamp the sentiment. 11. Seal the surface with two thin layers of matte medium. 12. Die-cut bells and greenery and adhere to the card adding some more thin washi tapes over the stems. 13. Finish by adding some dribbles or quinacridone gold to enhance the rusty look. I'd love it if you had a minute to pop over to the DecoArt blog to see all the samples I made. 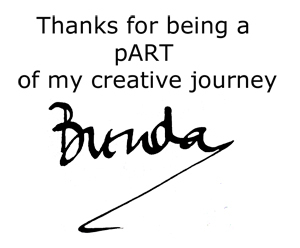 Fabulous as always Brenda ! That turquoise against the sepia colors is my favorite color combination. Gorgeous! 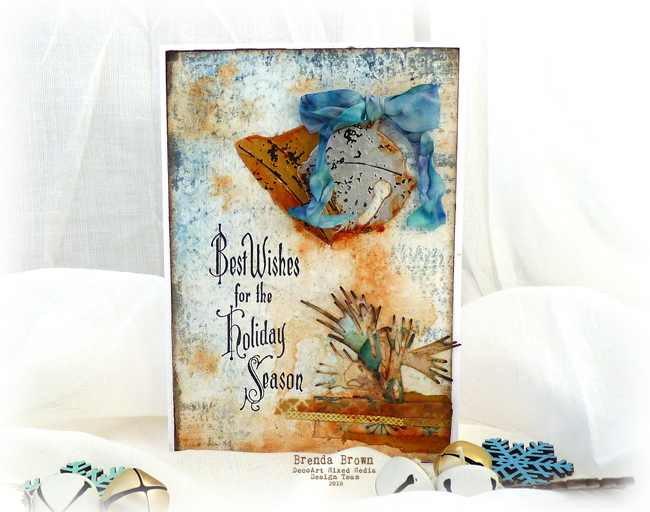 Love the weathered and worn look of the pitted technique - and an inspired touch to create your festive bells with that beaten metal look. I adore the colour tones of the card too... beautiful. My gosh! AMAZING ! WOW! 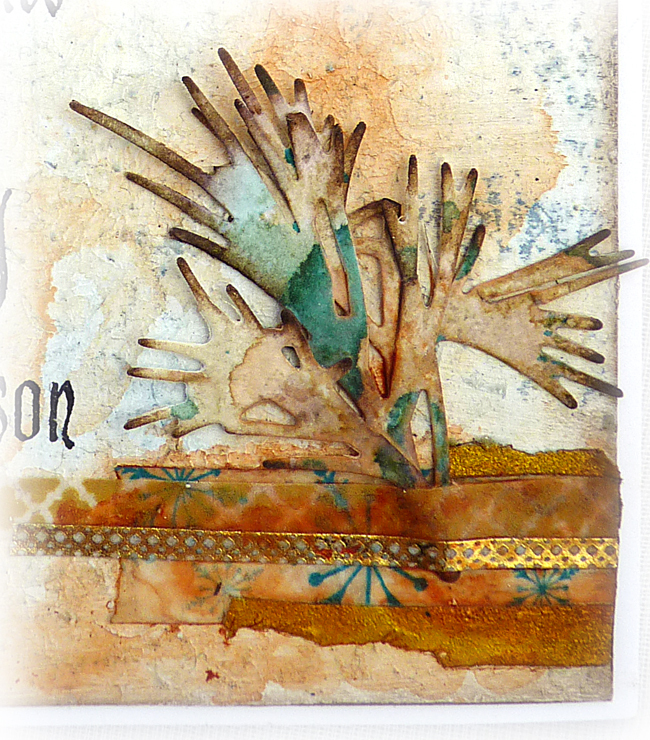 A gorgeous mixed media project, great textures and super techniques.